Yea the folks in Durham set watershed restoration back 100 years with the BS moves they pulled on that dam. Just goes to show that if you don't speak up the squeaky wheel gets the grease. PS: Hextall, I don't know if this is in your pervue but if you can, start to pull any boards that are in the dam out under the "we have to relieve the pressure on the dam for public safety" reason. It will start to get folks used to the lower water levels in the river. The Town of Newmarket's twitter page has some pictures taken today of the drained impoundment. How much or how far downstream of the dam is tidal from Great Bay? How far would this be pushed back if the dame was removed? Might make for an interesting spot for a salter program if the dam is removed. The tide comes right up to the dam... in fact, before I knew it was restricted to fishing, I'd paddle my kayak right up to the dam and fish below it for stripers. At low tide, it's hard (but not impossible) to paddle up through the rocks to the foot of the dam. So in theory, if the dam is removed, the head of the tide could move further upstream than where the current dam sits... but there's some preliminary data that suggests that there's a decent size fall just upstream of the dam (or at the very least, remnants of a previous dam). So my inclination is that without the dam, the tide won't make it's way much further than it already does. Right, the tides, saltwater, doesn't really move that far upstream. What happens as the tide rises the freshwater gets blocked and actually backs up in the river. Some of the fresh water rides over the salt water, which is denser, or if salters get caught in the change the salters will actually ride out their time in a fresh water bubble when the fresh water is cooler than the saltwater. Here's a picture I took this morning looking upstream at the dam (there's a footbridge across). The gates that are letting all the water out are located to the right. That's the Rt. 108 bridge. Those crib piles are either structures used to divert flows when they built the dam, or were a half-arsed structure before the more sound 1887 dam was built. The fish latter is on the left. What are we hoping will happen if this dam gets removed? The Lamprey has lots more dams, all the way to Deerfield. Does removing the Newmarket dam just move the issue upstream to the next one? I think we can all agree, at least from a habitat restoration standpoint, that any time there is an opportunity to have a dam removed, it's a victory. While it's true that there are still numerous dams upstream from Newmarket, removing any dam, especially the one closest to the head of tide is a great opportunity for a river's ecosystem. Also, if the opportunity for removal is missed, it could be decades before the opportunity presents itself again. 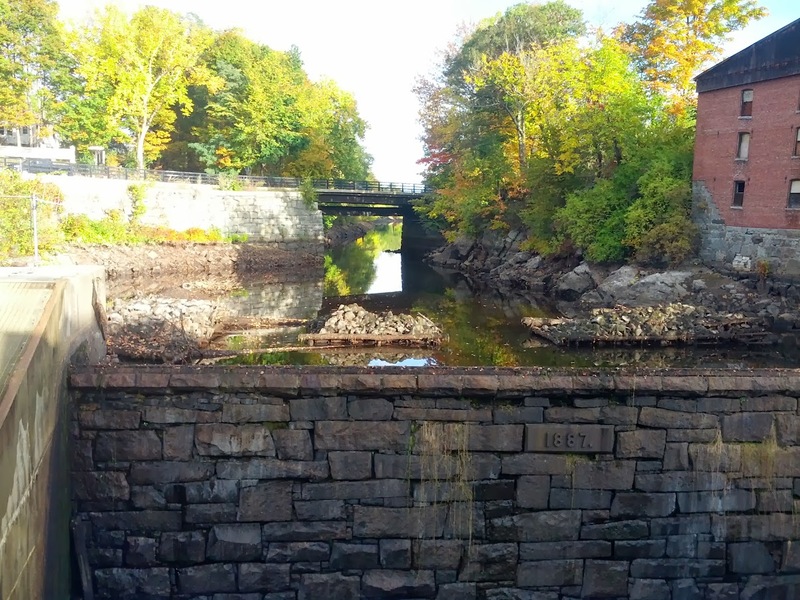 When Maine removed the Augusta dam on the Kennebec, stripers were soon found up at Waterville. Could we expect the same thing to happen in the Lamprey above Newmarket? Yup remove this dam and then head upstream to the next one. Each one gets a little easier because folks get to see the environmental and health improvement. In fact near the end folks will be racing to put their name to the next removal.